We have been repairing and supplying Sharp, Panasonic, Merrychef, Samsung, Merrychef, Mealstream, Merrychef Microaire and Maestrowave commercial microwaves to the catering industry since 1977. The microwaves we supply are ideal for restaurants, cafes, hotels, bed and breakfasts, take aways and anywhere that needs a fast reliable microwave for high volume output. We supply commercial microwaves nationwide with free delivery and can supply all makes at competitive prices with full manufacturers warranties. 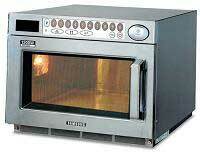 All the commercial microwaves we supply carry a full manufacturers parts and labour warranty. Service work is carried out by a manufacturers appointed microwave engineer. We are proud to be part of this nationwide network. Delivery on our commercial microwaves if free of charge and we can offer attractive quantity discounts for two of more machines. 1000 commercial microwaves are considered to be light duty. They are ideal for back bar for heating pies and pasties etc. 1300 & 1400 watt commercial microwaves are considered mid range, they are built to a high standard for heavy duty use.